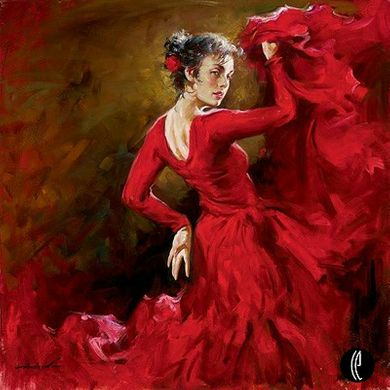 Andrew Atroshenko Limited Edition Embelleshed Giclee on Canvas :"Crimson Dancer"
Image Size: 40" x 30"
About the Artist: Andrew Atroshenko was born in 1965 in the city of Pokrovsk, Russia. Accepted as a gifted child in 1977 into the Children's Art School, Andrew graduated with honors in 1981. Two years later, Andrew entered Bryansk Art College, and in 1991 was accepted at one of the most prestigious art schools in the world, the St. Petersburg Academy of Art. In 1994, Andrew began taking part in exhibitions such as St. Petersburg Artists in Reutlingen, Germany, the exhibition of a group "Academy" in St. Petersburg (1996), and "Teacher's memory" (1997). After graduation from St. Petersburg Academy of Art in 1999, Andrew was invited by a New England, US based art group "Bay Arts" to take part in their exhibitions and activities, spending that entire year in the United States into the Millennium. According to Andrew, "This year in America gave me more as an artist then all eight years of my formal studies in the prestigious Russian academies. I am a descendent of farmers, and I was impressed by the New England's landscapes, and how a man in America avoids harming its environment. After seeing Royo and Pino at Artexpo New York 2000, I suddenly realized what direction I want to take my art in. After staying for a year in the United States, I spent two years in Russia perfecting my art. While Andrew's work was being sold successfully in galleries across Florida, California, Ohio and Arizona, the artist was taking part in a variety of group exhibitions and auctions in France, which resulted in all of his work being sold out. Since 2000, Andrew has worked with dealers from Western Europe and the US, exhibiting and selling his paintings in such US cities as Carmel , Scottsdale, Palm Desert, Las Vegas & Hawaii. Two of Andrew's pieces were also auctioned off by Sotheby's in 2002 and 2003. In 1992 Andrew married a fellow student, Maria, who is now an art critic in St Petersburg, Russia, and has a daughter named Alexandra. Like many artists, Andrew has his artistic references and influences, but his wife and daughter are the inspiration for his passion. "My work will always evolve, becoming more complex and detailed," says Rogerson. "I want my paintings to celebrate life and stay fresh . . . I try to stay away from the basic routine and technique because my joy for painting comes from the challenge of creating something entirely new." "My work will always evolve, becoming more complex and detailed," says Rogerson. "I want my paintings to celebrate life and stay fresh . . . I try to stay away from the basic routine and technique because my joy for painting comes from the challenge of creating something entirely new."